Kansas Preservation is published quarterly by the Kansas Historical Society. Our regular features include Preservation in the News and Happenings in Kansas. 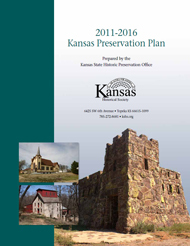 Kansas Preservation is available online in a PDF format. Kansas Preservation was the newsletter of the Cultural Resources Division. To order back copies, please email us at KSHS.shpo@ks.gov. Read our 2011-2016 plan and learn more about what is important to communities around the state. The Kansas Historical Society and Kansas State Historical Society, Inc., published Kansas Heritage from 1993 to 2006.